New measurements by NASA’s Fermi Gamma-ray Space Telescope reveal a binary star system whose pulsar switched from radio emissions to high-energy gamma rays. 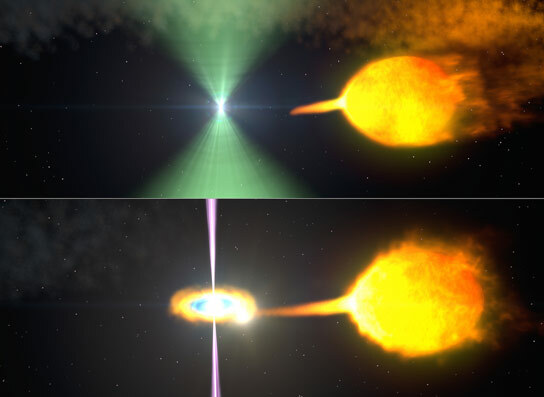 Zoom into an artist’s concept of AY Sextantis, a binary star system whose pulsar switched from radio emissions to high-energy gamma rays in 2013. This transition likely means the pulsar’s spin-up process is nearing its end. In late June 2013, an exceptional binary containing a rapidly spinning neutron star underwent a dramatic change in behavior never before observed. The pulsar’s radio beacon vanished, while at the same time the system brightened fivefold in gamma rays, the most powerful form of light, according to measurements by NASA’s Fermi Gamma-ray Space Telescope. A binary consists of two stars orbiting around their common center of mass. This system, known as AY Sextantis, is located about 4,400 light-years away in the constellation Sextans. It pairs a 1.7-millisecond pulsar named PSR J1023+0038 — J1023 for short — with a star containing about one-fifth the mass of the sun. The stars complete an orbit in only 4.8 hours, which places them so close together that the pulsar will gradually evaporate its companion. When a massive star collapses and explodes as a supernova, its crushed core may survive as a compact remnant called a neutron star or pulsar, an object squeezing more mass than the sun’s into a sphere no larger than Washington, D.C. Young isolated neutron stars rotate tens of times each second and generate beams of radio, visible light, X-rays and gamma rays that astronomers observe as pulses whenever the beams sweep past Earth. Pulsars also generate powerful outflows, or “winds,” of high-energy particles moving near the speed of light. The power for all this comes from the pulsar’s rapidly spinning magnetic field, and over time, as the pulsars wind down, these emissions fade. More than 30 years ago, astronomers discovered another type of pulsar revolving in 10 milliseconds or less, reaching rotational speeds up to 43,000 rpm. While young pulsars usually appear in isolation, more than half of millisecond pulsars occur in binary systems, which suggested an explanation for their rapid spin. “Astronomers have long suspected millisecond pulsars were spun up through the transfer and accumulation of matter from their companion stars, so we often refer to them as recycled pulsars,” explained Anne Archibald, a postdoctoral researcher at the Netherlands Institute for Radio Astronomy (ASTRON) in Dwingeloo who discovered J1023 in 2007. During the initial mass-transfer stage, the system would qualify as a low-mass X-ray binary, with a slower-spinning neutron star emitting X-ray pulses as hot gas raced toward its surface. A billion years later, when the flow of matter comes to a halt, the system would be classified as a spun-up millisecond pulsar with radio emissions powered by a rapidly rotating magnetic field. To better understand J1023’s spin and orbital evolution, the system was regularly monitored in radio using the Lovell Telescope in the United Kingdom and the Westerbork Synthesis Radio Telescope in the Netherlands. These observations revealed that the pulsar’s radio signal had turned off and prompted the search for an associated change in its gamma-ray properties. A few months before this, astronomers found a much more distant system that flipped between radio and X-ray states in a matter of weeks. Located in M28, a globular star cluster about 19,000 light-years away, a pulsar known as PSR J1824-2452I underwent an X-ray outburst in March and April 2013. As the X-ray emission dimmed in early May, the pulsar’s radio beam emerged. While J1023 reached much higher energies and is considerably closer, both binaries are otherwise quite similar. What’s happening, astronomers say, are the last sputtering throes of the spin-up process for these pulsars. The findings were published in the July 20 edition of The Astrophysical Journal. The team reports that J1023 is the first example of a transient, compact, low-mass gamma-ray binary ever seen. The researchers anticipate that the system will serve as a unique laboratory for understanding how millisecond pulsars form and for studying the details of how accretion takes place on neutron stars. Be the first to comment on "Fermi Discovers a Pulsar That Switched from Radio Emissions to High-Energy Gamma Rays"